"Winter lingered so long in the lap of Spring that it occasioned a great deal of talk." Now that the vernal equinox is only a couple weeks away, I'd be chill if yesterday's snow storm was the last opportunity to take literally cool macro photos of nature until Christmas. The beach grass is so neat. We don't get that on the left coast. No telling. When I drove my car in the icy cold weather, today, I had to put my top back up after the last time I drove. The snow looks like sea salt. Nice shot! We don't have snow here. Even the most exquisite cold gets old. I'm guessing those stalks would love to be greening again too. I love that shot, just gorgeous! Great shot, made me shiver! Bei uns gab es heuer fast gar keinen Schnee und der Frühling ist in vollem Gange. Spring can't come soon enough!! I am so sick of this winter. 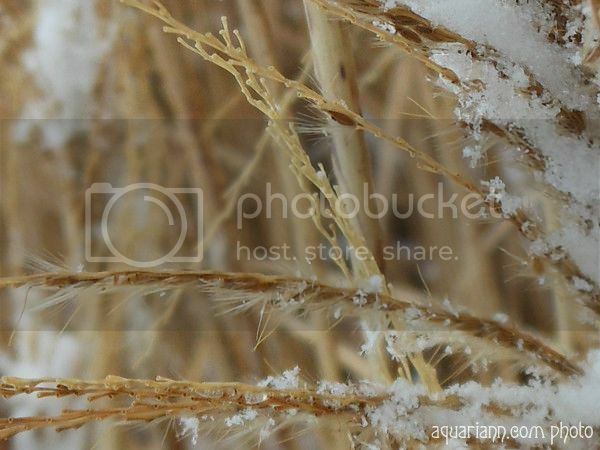 Beach grass and snow...now that's something I haven't seen yet. We got a light dusting of snow on Monday, and that was it. Spring-like temperatures are expected to arrive this weekend and will be with us most of next week, which I'm very much looking forward to. I can't for warmer weather to linger with us longer, though. Happy WW!! That is a beautiful photo! Enjoy your Wednesday. What a beautiful shot. You have a great eye! That is really a beautiful photo! Although I live on an island, I rarely venture out in the cold weather if I can help it. This shot really let me see the wintertime beauty of the beach - and from the warmth of my own living room too! Thanks for sharing! It sure is pretty...but I'm definitely ready for Spring!